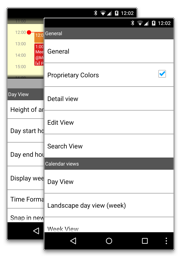 Several different kinds of views help you to view your events. 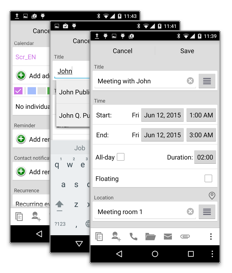 They are highly configurable so that you can fit them to your needs. 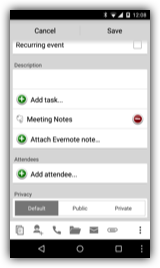 A flexible edit view allows you to easily enter your events. 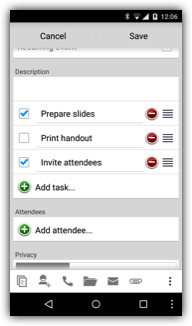 To make it easier to create similar events you can choose from previously entered titles, locations and attendees or you can use templates to create events. 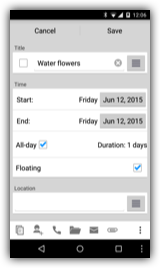 It is also possible to create recurring events, e.g. daily, weekly, monthly or yearly events or events on certain days of the week. 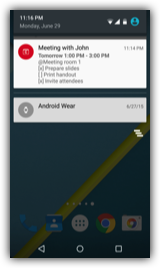 Additionally Google event colors are supported, i.e. 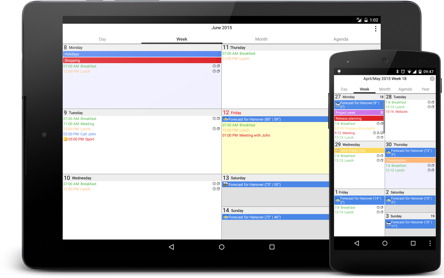 you can have different colors in the same Google calendar. 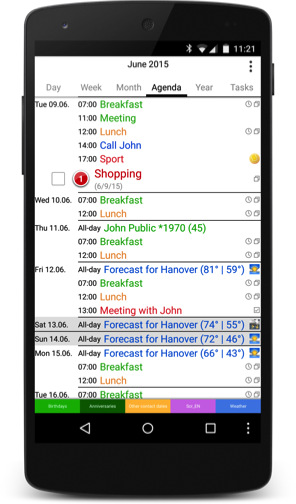 The detail view gives you a quick overview of a single event including the location and the responses of all attendees. 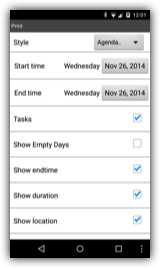 Using the tasks in events function you can also add tasks to your events. 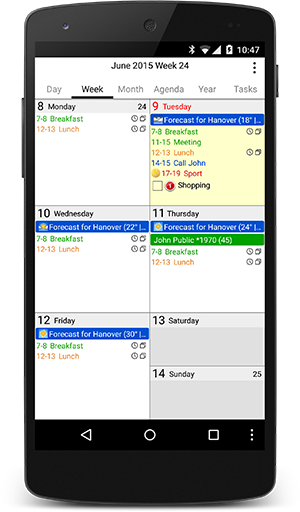 CalenGoo can sync with Google Tasks and display your tasks on their due dates in its calendar views and all tasks in its task view. 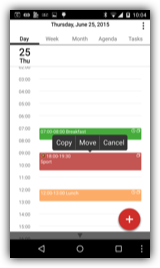 Just tap and hold an event to start the drag&drop operation, which allows you to easily copy or move the event to a different time or day or to open or delete it. 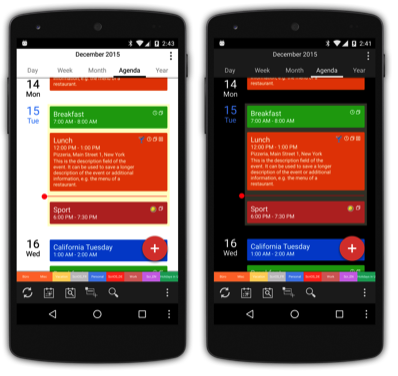 CalenGoo supports Google Calendar icons, i.e. 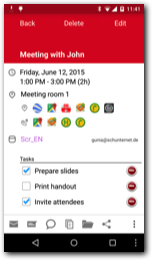 you can add icons to your events that will also be visible in Google Calendar (when syncing directly with Google Calendar). 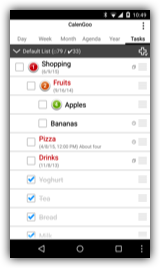 CalenGoo allows you to display your reminders in several ways. 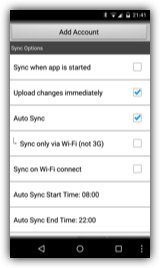 They can be displayed as status bar notifications or in a pop-up window. 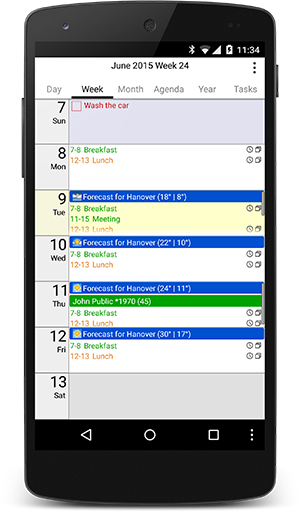 You can choose a different sound for each calendar, mute the phone during events or automatically repeat the notification so that you don't overlook it. 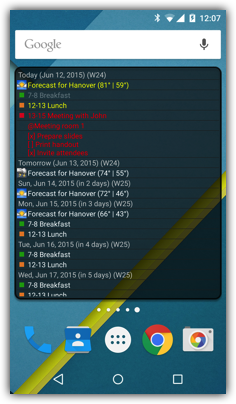 It is even possible to speak the title of the reminder when using the pop-up window. 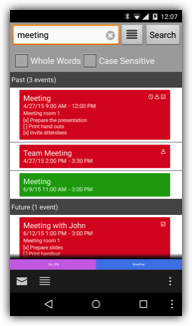 You can invite attendees to events. Google Calendar will send them invitation emails and you can see their responses in CalenGoo's detail view. 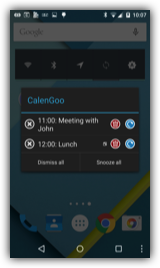 CalenGoo can display the birthdays of your contacts. 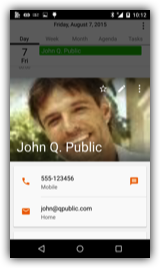 When you open a birthday the contact is displayed so that you can directly text or call that person. 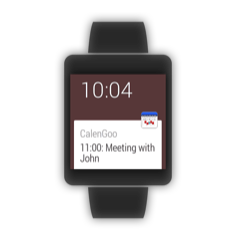 If you have an Android Wear watch you can see CalenGoo's reminders on that watch and can create events and tasks by voice. 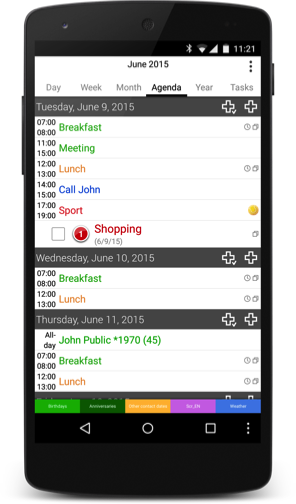 Additionally a white and a black watch face are available that display your upcoming events as colored bars. 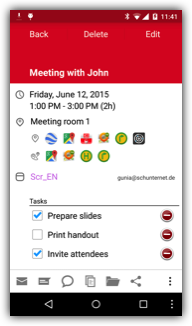 Using the print function you can print your events in different formats into PDF files. 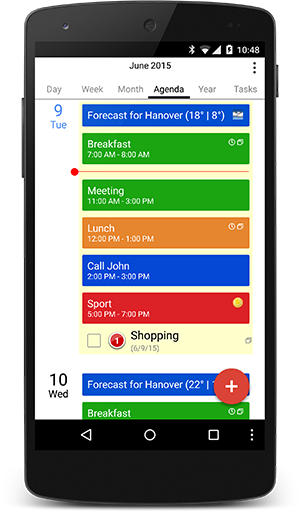 To see all your past and future Google Calendar events (instead of only a limit time range that the Android calendar syncs) you can sync CalenGoo directly with Google Calendar. 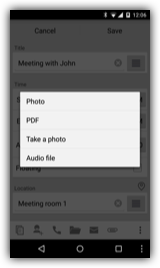 You can attach files (images, PDF files from images and audio recordings) to events. 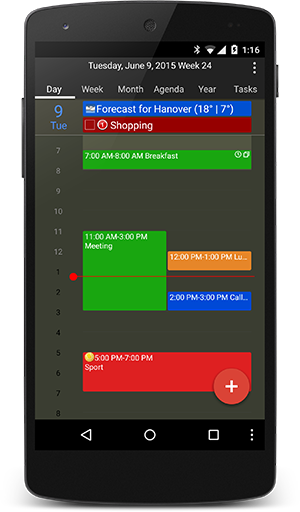 Using CalenGoo's widgets you can see your upcoming events directly on your home screen in day, week, month or agenda format. 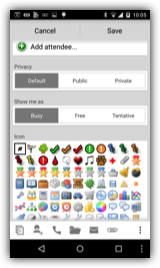 You don't need to start the app. A light and a dark style are available. Using the optional CalenGooSMS app, you can send SMS reminders to a fixed phone number (e.g. 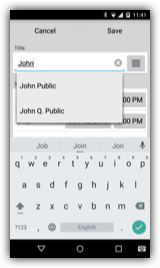 yourself) or to different phone numbers for each of your events (e.g. 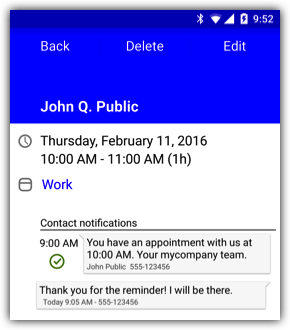 to remind an attendee or customer of their appointment). 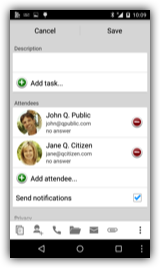 If you get a response afterward from that phone number, it is displayed directly in the event’s detail view. 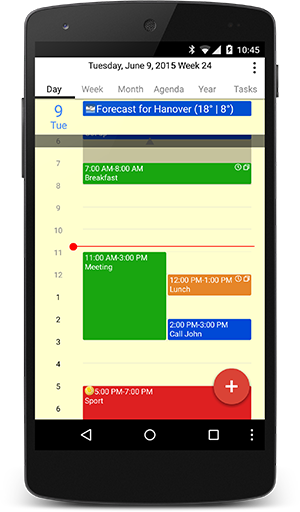 CalenGoo runs on Android phones and Android tablets. 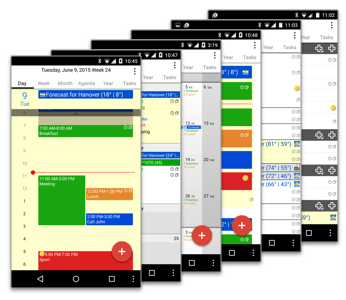 So with a single purchase you can run it on all your Android devices.